JustBabyTeethers.com are delighted to present the famous Dress Me Up Organic Teething Bonbon. With so many on offer these days, it is great to have a make you can recognise. The Dress Me Up Organic Teething Bonbon is certainly that and will be a great buy. For this reduced price, the Dress Me Up Organic Teething Bonbon comes highly recommended and is a regular choice for lots of people. Dress Me Up Organic have added some excellent touches and this results in great value. The Organic Teething Bonbon® is the wonderful alternative to plastic teethers for your teething baby's sore gums! 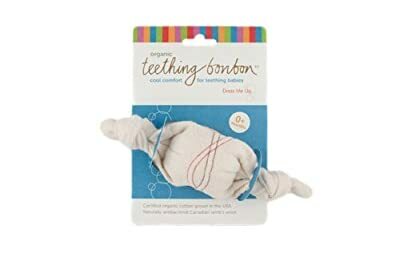 Certified organic cotton and naturally antibacterial wool make the Organic Teething Bonbons® a gentle and safe solution for baby's teething pain. Babies love the texture of this soft, natural organic cotton teether. The Bonbon is handmade in Canada and features a unique stiched pattern. To use, dip the cotton ends in water and freeze it and it becomes even more soothing for those tender gums. As seen in Fit Pregnancy, Pregnancy & Newborn, Mompreneur Magazine,Cool Mom Picks, Savvy Mom, Urban Rush, and more! Made by Dress Me Up, the Organic Teething Bonbon® is handmade from certified organic cotton and naturally antibacterial lamb's wool. Made in British Columbia, Canada.